Your home is one of your biggest investments—maybe even the biggest—so it’s important that you take good care of it. And it’s not just about maintaining its appearance and resale value, but about boosting its curb appeal and making it a more comfortable and enjoyable place to live. One of the most effective ways to do this is to make sure your roof is in good working order. If the roof on your Omaha, Nebraska, home is sagging, leaking, rotting, or has just seen better days, it may be time to call the pros at Elite Exteriors for a roof replacement. Elite Exteriors has been providing dependable roof replacement services to Omaha homeowners for more than 20 years. 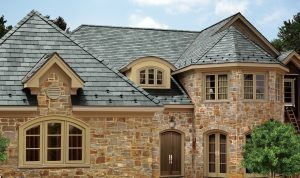 As a Malarkey and IKO ShieldPRO plus+™ certified roofing contractor, we are qualified to install top-of-the-line class 4 roofing systems, which will provide your home with the ultimate protection against wind, rain, sunlight, and other harsh weather conditions that can wreak havoc on your roof’s structural integrity. Moreover, our customers who have had issues with hail in the past will be happy to know that the class 4 roofs that we install are as close to “hail proof” as you can get. Boasting the highest impact resistance of any shingle roof on the market, these roofs are backed by a lifetime warranty and will provide your home with many years of protection. In addition to safeguarding your home against the elements, a roof replacement can make your home more comfortable by improving energy efficiency. When you cut down on thermal transfer through the roof, your HVAC system won’t have to work as hard to maintain a consistent interior temperature in your home. Not only will this give your HVAC system a break and help prolong its life, but it could also translate to lower monthly heating and cooling bills. To learn more about what a new roof can do for your home in the Omaha area, or to schedule a free consultation to discuss your roof replacement needs, contact Elite Exteriors today.